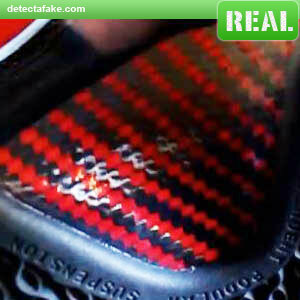 Next, look at the bottom of the shoe. 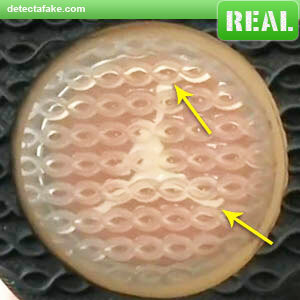 Look at the jumpman's position on the heel bubble. The sumpman should be centered like the one in the real pic. 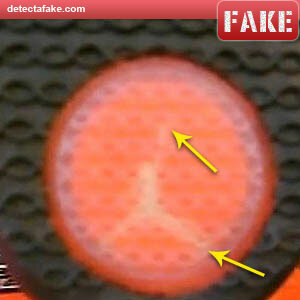 Notice the jumpman in the fake is positioned at the bottom (sorry for the blurry pic). 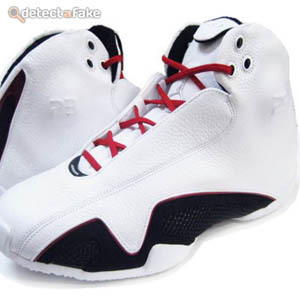 Next, look at the carbon fiber panel on the shoe bottom. It should be textured to the feel, like the one in the real pic above. 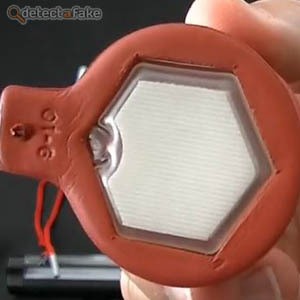 The one in the fake pic looks to be a solid piece of plastic that's colored to look like the real one. 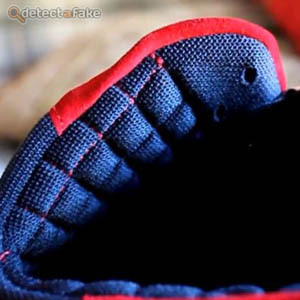 Make sure the lining of the shoe is a quilted pattern like the picture above. 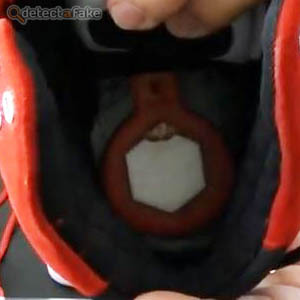 Next, pull back the insole to reveal the interchangeable pod or air pillar. It should have 1 removable pod and 1 spare pod that comes with the shoes (For different weights). Next, pull back the tongue and look at the embroidery on the inside top. The text will vary, based on the colorway. 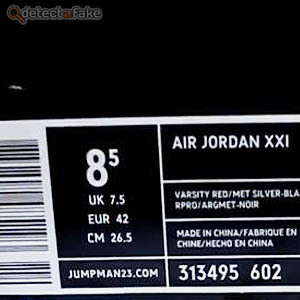 Below are the text that should match the colorways. 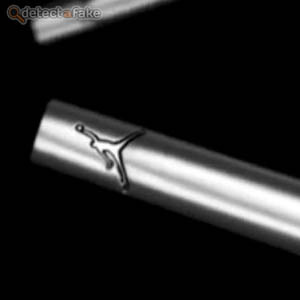 Next, make sure the lace tips have the jumpman logo on them. For this next step, you will need a black light. 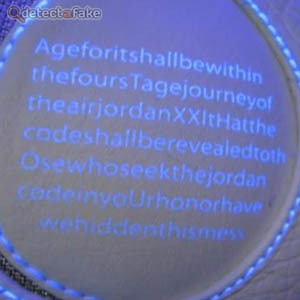 If you have a shoe that has the leather circular panel on the side, shine the black light on it and a message will appear. 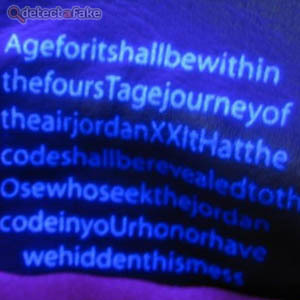 If no message appears when the black light is on it, the shoes are fake. If your shoes have the suede circular panel on the side, pull up the flap on the top of the tongue. 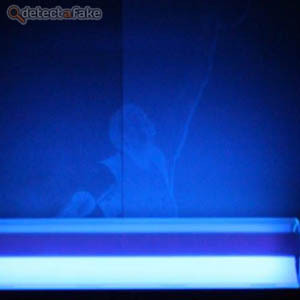 Separate the 2 layers and shine the black light on it. 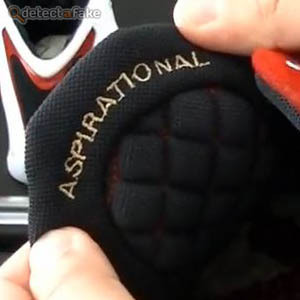 The message above should appear on the leather side. 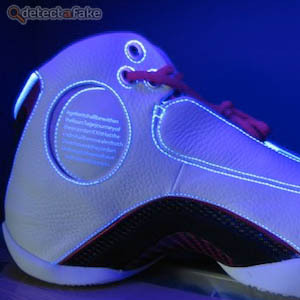 Again, if no message appears when the black light is on it, the shoes are fake. Next, if the shoes are new, they should come with an insert card. 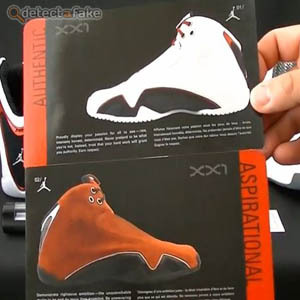 The card should match the shoes and the title on the side should match the tongue embroidery. The card should have just one corner rounded. 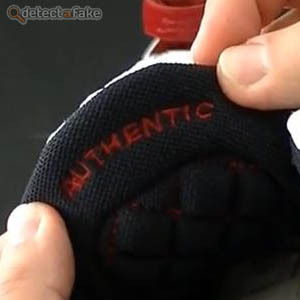 If any of those things are wrong, they're fake. Next, if you do have the insert card, turn it over and shine the black light on it. 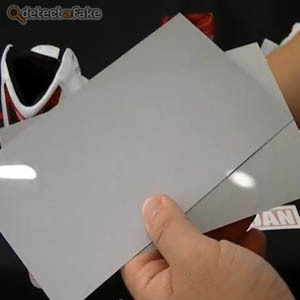 The jumpman should appear if you have an authentic card.